So, it is finally Christmas Eve. For some reason, be it the weather or the lack of visitors, it does not feel like Christmas. At all. Honestly, I think it may be because I was not at home for Halloween or even Thanksgiving, so I am still stuck back in October. Whatever my feelings may be, we still had our traditional Christmas Eve meal consisting of our chili and cornbread. We had the menu set for dinner, but dessert was still up in the air. I wanted to have something a little special, as it is Christmas Eve, but it still had to feel comfortable to accompany the homey meal we were eating. This tart was the perfect solution to my dilemma. It was sophisticated and still a bit rustic at the same time, and the recipe was as easy as could be. This tart truly surprised me. I really, really hate white chocolate. In my opinion, it does not even deserve the honor of being called chocolate; it is too sweet and too bland. The filling of this tart was nothing of the sort. 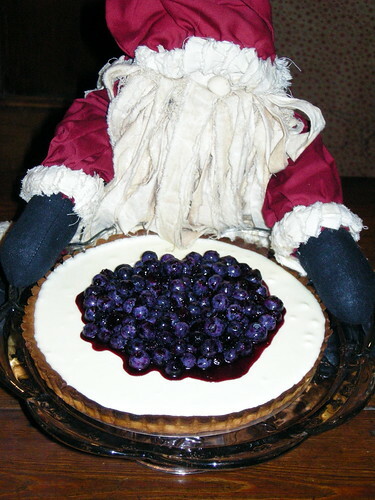 It was fresh and bright and the flavors melded so nicely with the sweet blueberry topping. Merry Christmas everyone! Dissolve gelatin by sprinkling it over cold water. Let stand for 5 minutes. Add chocolate to the bowl. Warm milk in a saucepan with vanilla extract. Stir together egg yolks in a bowl and gradually whisk in a small amount of warmed milk. Transfer warmed egg yolks into saucepan with the rest of the milk and cook over low heat, stirring until it thickens enough to coat the back of a spoon. Strain custard through a fine sieve into the bowl containing the white chocolate and gelatin. Stir until white chocolate is completely melted and Gelatin is dissolved. Cool to room temperature. Whip cream until it just forms soft peaks. Add Grand Marnier. Fold whipped cream into white chocolate custard. 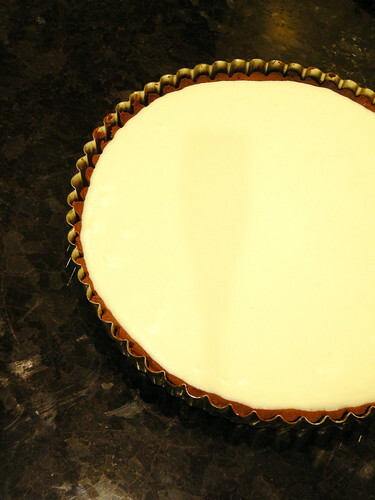 Pour into prebaked tart shell and refrigerate to set for at least 1 hour. Put one fourth of blueberries in a saucepan with water, sugar, and lemon juice. Mash blueberries with a spatula and cook over low heat, stirring occasionally, until mixture has cooked down and thickened. Cool. Stir rest of blueberries into jam. 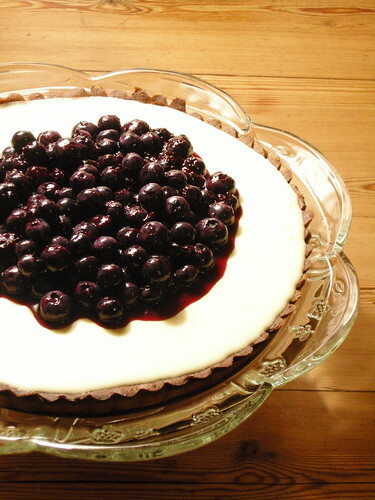 Spoon blueberry topping over chilled tart and serve immediately. THis might be the most precious thing I have ever seen!